Arsenal have reportedly received a boost in the pursuit of Paris Saint-Germain midfielder Christopher Nkunku ahead of the summer transfer window. The north London side were keen on a temporary move for the 21-year-old in January, but Les Parisiens declined the approach as they were not keen on parting ways with his services. Nkunku has since established himself as a regular starter under Thomas Tuchel, but The Sun reports that the midfielder has declined a new contract as he sees his future elsewhere. The Frenchman currently has 15 months remaining on his existing deal with the club and it is claimed that Les Parisiens could accept a fee in the region of £30m to sanction his sale in the summer. 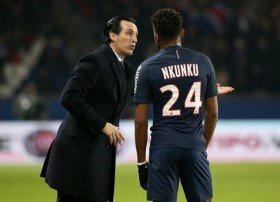 Gunners boss Unai Emery worked with Nkunku during his two years at Paris Saint-Germain between 2015 and 2017, and it is suggested that the Spaniard is impressed with the Frenchman's versatility. Nkunku has primarily featured in the centre of the park, but his best performances have resulted from the right side of the attack with the reigning French champions.